I have two knitting WIP at the moment, but a couple of nights ago I crocheted some granny squares. I started this project quite a while back. The squares are made from scraps of acrylic, and I am edging each square with white. This is also my first yarn along...I have been reading Ginny's Small Things blog, and really enjoy the Yarn Along each Wednesday. I have discovered some delightful blogs by clicking on the links. I am, as the picture below shows, reading Dracula...and enjoying it so far. I have been crocheting them without any real plans about what I would make them into. I had thought large cushions, but after seeing some of them joined up, I've decided they will make a lovely blanket, probably throw size for the lounge. 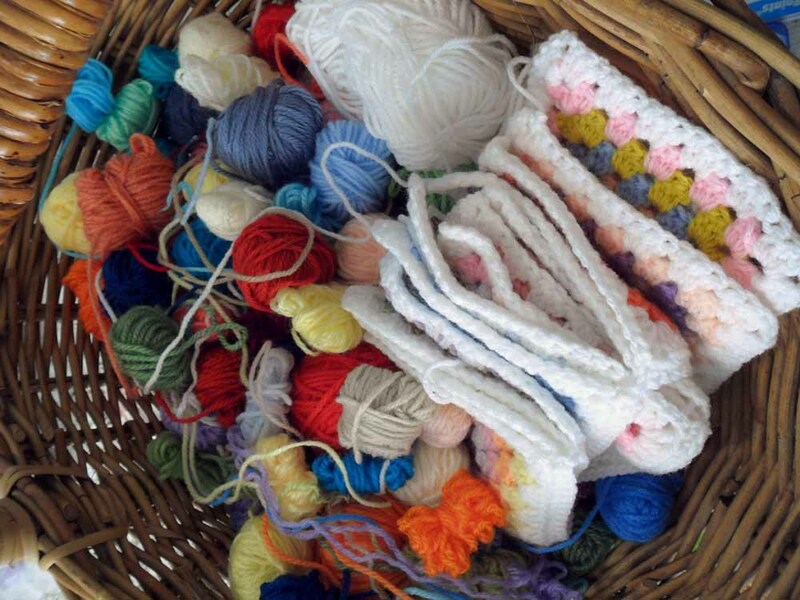 Yarn scraps...too good to throw away, not enough to do much with! That looks like an excellent scrap busting project :) The white really ties it all together too. It's a great scrap busting project...and a lot of fun. Beautiful! The white edging really brings out all the colours and then brings the whole thing together! Thanks Emma...I'm really pleased with how it's looking. awesome scrap project. i am still so new, i don't have that many scraps yet, but i am sure it won't be long! 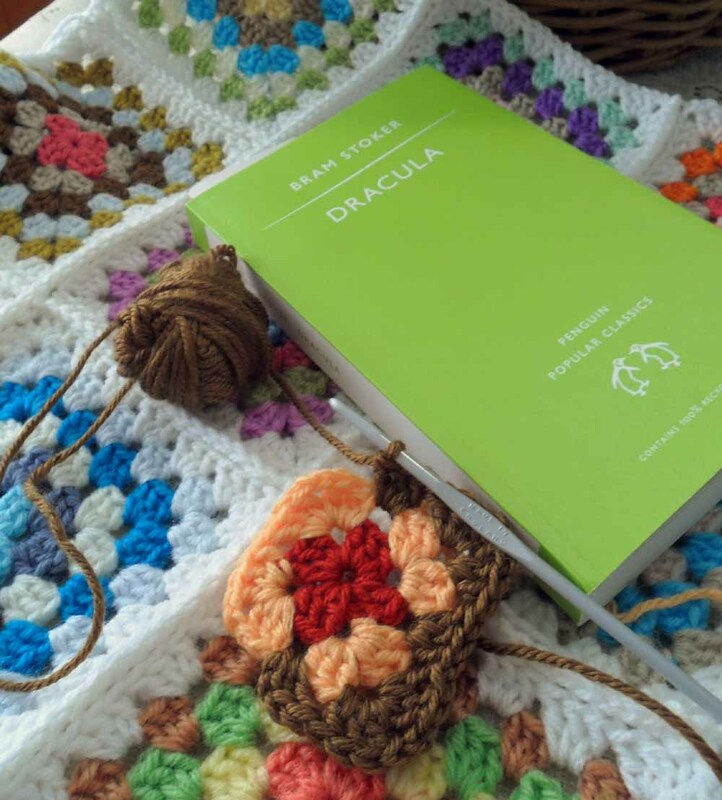 i loved reading dracula, good one! Oh, that's so pretty! White is my favorite color for bringing scraps into harmony. I know some people like the stained-glass effect you get with black, but to me white feels more homey and open and light. I made a log-cabin-style scrapghan last year and tied it together with white and it turned out so well. Yours looks lovely also. Oh my goodness - your stitches are so even and perfect! And the squares are all identically sized. Beautiful work! The white makes everything pop. Welcome to the yarn along, your blanket is going to be so pretty! I am a newbie to the yarn along too, started joining in last week. 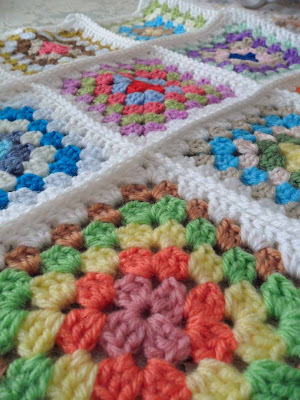 Love the throw you are working on, so bright and happy looking. Those colors with the white makes me very happy, your throw is going to be beautiful! That's a great idea and I love how it looks so far. Welcome to Yarn Along! 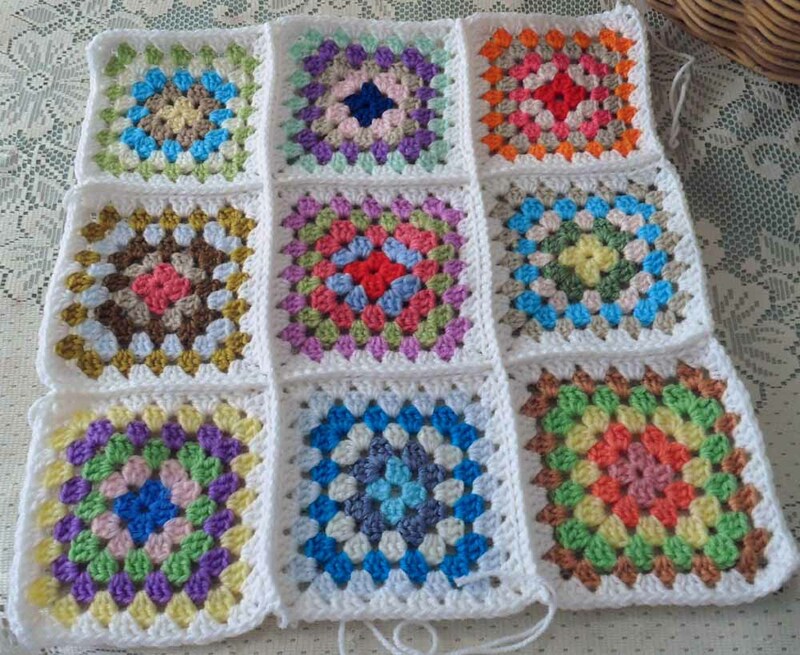 Hey Kylie, your granny squares are looking great.....nice to be able to use up scraps, whatever they are.. It will be nice to snuggle under when Winter arrives. Thanks fro stopping by my blog to say 'hi', great to hear form you. Absolutely beautiful squares! Almost makes me question my flower, maybe I want to do grannies instead? ^.^ Thanks for the color tip! Nice to meet you. Your blanket is lovely...very spring-like... It's a nice feeling when you make something out of little odds and ends of left over yarn.